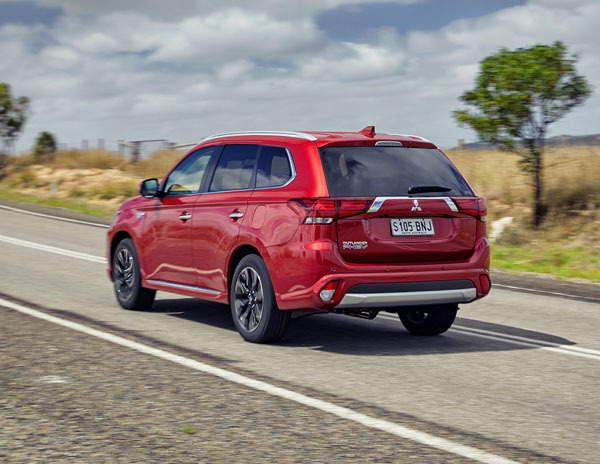 Mitsubishi has been at the forefront of pure electric and hybrid vehicles for many years, both in Australia and globally. The Mitsubishi i-MiEV took its place in Australian automotive history as it was the first ever pure electric production car to go on sale in this country. The Japanese giant is now starting to push hard in Australia on the PHEV (Plug in Hybrid Electric Vehicle) front. 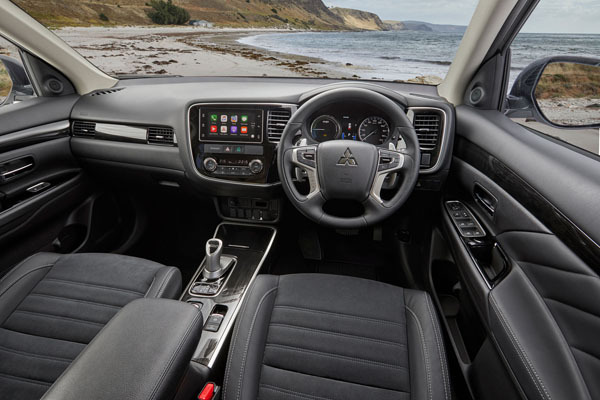 The Mitsubishi Outlander PHEV was launched downunder in 2014 and has just received a series of major revisions. These are far reaching, not only on the hybrid drivetrain, but also to the styling, infotainment, suspension and overall refinement. 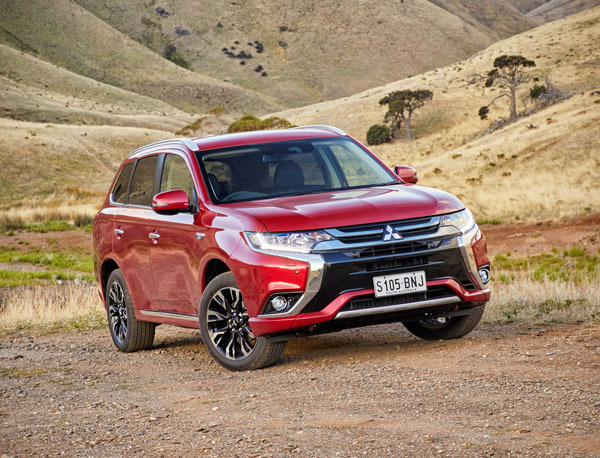 Mitsubishi has given its PHEV a more upmarket look and feel to aim it beyond the early adopters who have been the biggest customers to date. Indeed, it has looks that are almost futuristic in its class. The body has a new front end and a tail tuck that have chromed and silvered highlights work well. Inside, the changes are more subtle, there’s a redesigned steering wheel, new accents in the trim, modified seats, and premium materials. Multiple changes to the Outlander’s drivetrain (which is an all-wheel-drive system, something that’s less and less common these days) make it noticeably more efficient. Official fuel consumption is down by about 10 per cent, from 1.9 to 1.7 litres per hundred kilometres. This new model features an ‘EV Priority’ mode that lets the driver operate the Outlander purely in EV mode provided there is sufficient charge in the batteries. Excellent news for your neighbours if you do very-early morning starts, or get home late at night. It also stops all exhaust pollution in underground carparks. The biggest news is that a DC fast-charge system can recharge the battery to 80 per cent capacity in around 25 minutes. That’s around the time you might spend having a coffee or doing some shopping at the typical roadside service area. Australia is still seriously lacking in charging stations, that situation will eventually improve. However, a major part of the problem is the complete lack of interest by Australian governments in assisting those who want to buy clean running vehicles. As a last resort if you’re making long trips Mitsubishi Outlander can run on petrol for 500 to 600 km if you drive sensibly. The latest Outlander is available in LS and Exceed grades. Both have new features such as; smartphone Link Display audio with Apple CarPlay and Android Auto2 integration; DAB+ radio; powered and heated door mirrors; LED headlamps with auto levelling; and a DC fast charging socket. Topline Outlander Exceed also gets adaptive cruise control; forward collision mitigation that can also ‘see’ pedestrians; 360-degree around monitor; automatic high beam; lane departure warning; blind spot monitor; lane change assist; and rear cross traffic alert. Ride quality and comfort have been improved, primarily thanks to changes to the platform that increase structural rigidity. There’s additional sound deadening material and revisions to the suspension to reduce noise. The latter is also aimed at more precise handling. On the road in a complex drive program arranged by Mitsubishi we had everything from peak hour traffic in Adelaide’s CBD, to open country roads, including some dirt sections and winding hills. Fuel consumption ranged from zero in the city and for the next 30 km out of town, to seven to eight litres per hundred kilometres once the battery was discharged. Some added charge was picked up on downhill running, but this was minimal. Comfort is very good, with a near silent cabin on smooth roads and a well controlled ride. Rough surfaces did significantly increase sound levels, but on the whole the Mitsubishi is almost in the luxury sedan class. As well as the fascinating Outlander Plug in Hybrid Electric Vehicle it’s also sold with conventional petrol and turbo-diesel engines. Note: These prices do not include government or dealer delivery charges. Contact your local Mitsubishi dealer for driveaway prices.